Bolle 11469 11469 Draft Shiny Black - Photo Amber Sunglasses FREE SHIPPING! When performance and a great fit are essential, choose Bolle's Draft Photo Amber Sunglasses. These wrap shades are designed for a medium to large face and provide superior optical clarity. The ultra-lightweight Trivex lenses, with dual-sided hydrophobic/oleophobic and CarboGlass coatings deliver glare-free clarity as well as impact and scratch resistance. The frames are crafted from durable nylon for light and flexible wear without sacrificing strength and durability. Bolle's ThermaGRIP hydrophilic nose pads and temple tips keep sunglasses comfortably in place for all day wear. Nose pads are adjustable for a custom fit and the lenses can be easily changed to match versatile lighting conditions with Bolle's Optics Control System. 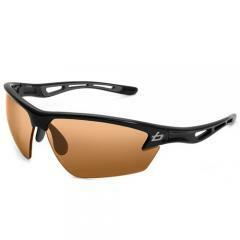 ©2002-2019 CopsPlus.com: Bolle 11469 11469 Draft Shiny Black - Photo Amber Sunglasses FREE SHIPPING!